Apparently $TSLA Germany Service Centers were told to prepare for first deliveries of Model 3 starting end of November. Demand must be through the roof, tweeted a twitter user who goes by the name Realist (@TeslaAgnostic). A quick look at the tweets will tell you that the user stays on the bear side of Tesla. According to Tesla shorts, since Tesla is asking its European centers to gear up for Model 3 sales, demand in United States is weak. If Tesla manages to build an average of 3000 to 5000 cars per week over the next six months, they will deliver 81,000 to 135,000 cars during this period. Tesla will clearly exhaust its customer base in North America for these high priced models within the next six months. As is the case with Tesla Shorts, they just keep moving from one theory to another, as long as it shows Tesla in a difficult situation. Report after report has made it clear that Tesla Model 3 sales has gone through the roof in the last three months. According to Goodcarbadcar data, Tesla sold 14,250 Model 3s in July, making it the seventh most sold passenger car in United States. In the top seven, for a car that costs more than $50,000. Tesla has been registering VINs at a breakneck pace, another indication that customers are still ordering their cars. But nevertheless, Tesla shorts keep saying Model 3 demand is week. The Performance Model 3 starts at $64,000 and races past $80,000 if you stay long enough in the designer studio. That’s the pool where large luxury sedans like Mercedes Benz S class, Model S and BMW 7 series swim. The large luxury sedan market reported sales of 79,790 units, a weekly average of just 1,534 units. Once Tesla exhausts its backlog, at best Tesla can expect to sell around 1,500 cars per week (performance version), if we go by the law of segment averages. The performance version by virtue of its high price must be the most profitable Model 3 version. Tesla should sell as many Performance Model 3s as they possibly can every month. The more the better. If the more is better, then why lock themselves in United States when they already have operations in nearly 30 countries. So, sorry shorts. Your argument makes no logical sense. Tesla will be making a mighty big mistake if Performance Model 3 is not in Europe before the end of this year. We were not able to independently verify the claim that Tesla is asking its overseas centers to get ready for Model 3. But since the positive news came from the shorts, and also because it makes logical sense for Tesla to start overseas delivery of higher priced Model 3, we covered the story. 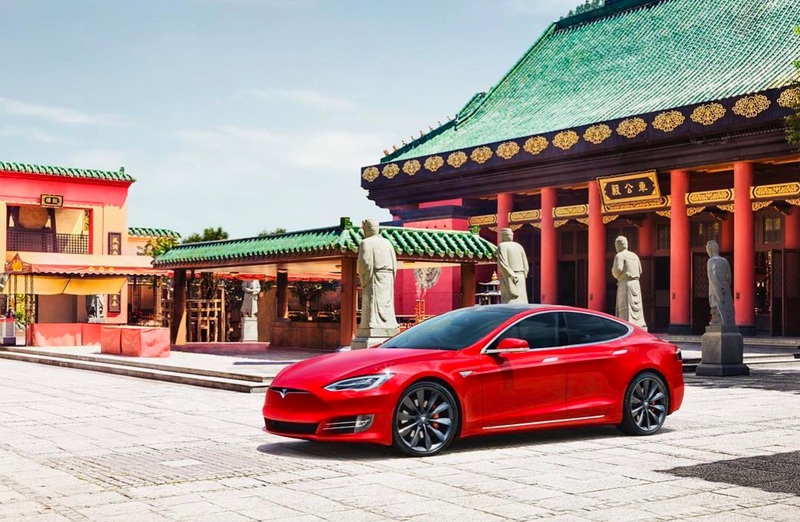 And why is there a Model 3 picture with China in the background? Because Model 3 Performance Version should not only sail to Europe but also to China as well. It’s bit difficult, thanks to additional trade war induced import tariffs. But every buyer who is ready to pay for P3D must get his car, no matter which country he is in. Just add the shipping cost if needed and deliver it.